At last year’s Anaheim convention, we presented with Jim McNay. 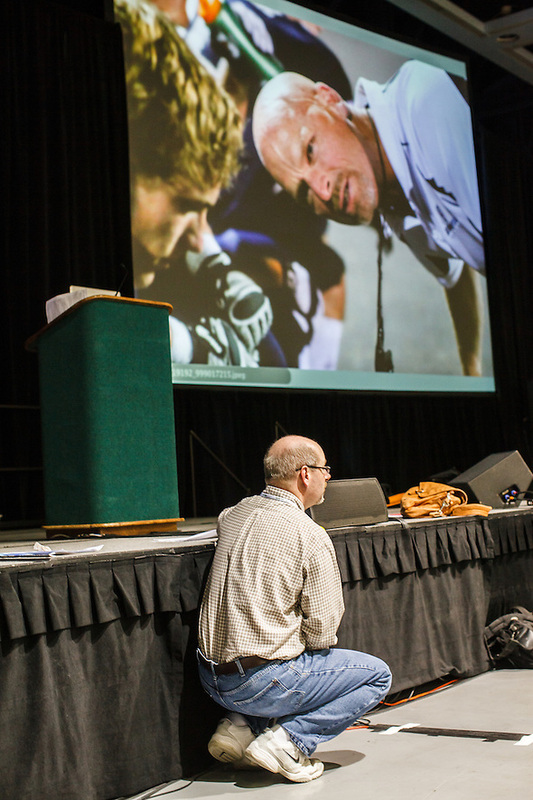 Jim is an influential photojournalism educator who helped us create the original presentation. I can trace most of my photography relationships to Jim. Jim also connected me to Grant Morris the photographer who allows Mark and me to use his college photography portfolio for our presentation. Grant was a student at Brooks Institute and the Eddie Adams Workshop. Jim started the Visual Journalism program at Brooks and he has worked many of the Adams weekends. Mark and I also use Zach Hetrick’s high school portfolio. View Zach’s current website to see how he developed. View Grant’s current portfolio. Zach and Grant are available for questions. You can contact them directly or use the comment section below and everyone can respond. Mark and I are also available to critique photos and portfolios. Mark might resemble the intense coach below, but he is a kind instructor. For those who attended our workshop, what was beneficial? What more would you like to know? 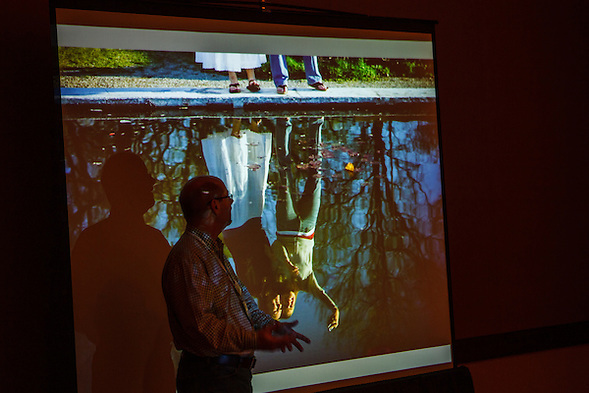 If you did not attend the workshop, what do you want to know about creating portfolios? Please use the comment section so that others can learn from your remarks. This entry was posted on Saturday, April 21st, 2012 at 10:14 pm. It is filed under Education and Technology, Travel and tagged with Photography, presentations, Seattle. You can follow any responses to this entry through the RSS 2.0 feed. seven myths which appeared in Photoshelter this week. 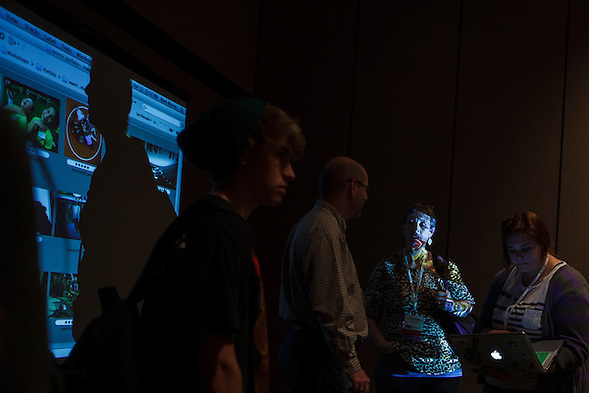 This session was really helpful. As a first-year photography teacher and fourth-year journalism adviser, I’ve been challenged by the idea of having my students put together a portfolio of their work. My initial thoughts were that it should simply be a collection of what they had done, showing me they learned the skills I was trying to teach them. But this presentation helped me realize that cramming anything and everything into a portfolio doesn’t do anyone any good. It’s cumbersome and overwhelming for the students, and even more so for the viewer. The insight that I gained both during the session, and afterwards via email from Bryan, has helped me streamline what I want from my students. I don’t need to see every picture they’ve taken for my class–I already have! They turned them in to me at some point. What I DO want to see is what THEY feel to be a collection of their best work. What I think they excel at may not be what they think they’re good at. As my students have started to assemble their work, we’ve had many discussions about the difference between a good shot and a great shot, or the difference between their favorite shot and their strongest shot. It’s been a learning experience for all of us. I’ve learned a lot, teaching them over the school year. I’ve learned a lot just in the last week, about what they value from the lessons I’ve presented to them. I’ve learned that I’ve got a long way to go, too. There is so much that they are anxious to learn, that I need to learn, so that I can teach them. I’m definitely looking forward to the professional development I have planned at the ATPI Summer Workshop in June—Photoshop certification, here I come! The best part? Thinking back to August, when I started with these kids–most of them had never held more than a simple point and shoot in their hands. Now, they’re discussing composition, f-stops, shutter speeds, debating artistic purpose, challenging me with questions and chomping at the bit to try new things. They were intimidated by our DSLRs at first, but now every single one of them wants one of his or her own. It’s a great feeling to see that spark in them. Thank you for your comments and continuing the conversation. I am reminded why I started teaching the workshop. When I was first asked to critique portfolios, I was at a large visual art college fair. There were hundreds of students with their portfolios, matte boards and photo books. Most of the students had no idea what they were doing… and I did not either! I would ask each student what they had been told and most said, “Bring your 15 to 20” best photos. Even then, the students brought 50 photos. At the national conventions, students had not been instructed on presentation. I needed structure, so Mark and I created the workshop. The quality of the presentations has improved dramatically. Just as you have noticed how your students have started discussing f-stops, we have noticed how our students and instructors discuss portfolios differently. Teachers like you will take us to then next level. What must happen next?